About five years ago, my hunting life changed, and I have not looked back since. I am talking about turkey hunting with a bow. That’s right, turkeys. Those goofy looking birds that at times seem so dumb, they will hang out in someone’s driveway, or stare at themselves in a reflection thinking it is another bird. However, when you are in the turkey woods in the spring trying to get them close enough to take an arrow, they often make fools of even the most experienced hunters. Maybe that’s why Ben Franklin respected them so much. Some of friends have said….”why screw around with a bow… just shoot them in the head with a shotgun”. Well, to each his own, but my weapon of choice to try and take these birds with, is a bow. In my opinion this is one of the greatest hunting challenges anywhere. You see, turkeys are tough dudes. They can see like they have binoculars for eyes, they can run like a scared rabbit, and once they take off, a couple of flaps of those big ol’ wings and they can get up and glide a mile away. I wonder at times if their feathers are part armor. Some guys have told me if these birds could smell, few hunters or predators would ever be eating wild turkey. Five years ago, spring turkey hunting changed my bowhunting life and ruined my desire to trout fish. There is just something about getting set up at pre-dawn and hearing them wake up on the roost….then softly calling to them and having them answer…..hearing them fly down…..then calling for hours and not even getting one freaking shot at a bird. Those crazy dumb looking birds often make me look stupid. But, once in a while, it all comes together. I call, or he sees my decoy set up and comes charging in. At those times, HE is the one who turns love sick stupid and I put the arrow where it needs to be. I’ll ask some of buddies how their shotgun went that day and they will say ”ah…I just saw a couple of jakes…”. If I get a good archery shot opportunity at a jake, I often take it. The same goes for a “jobbler”. What’s a jobbler, you ask? Well, he’s not quite a gobbler and he’s a little bigger than a jake. So, jobbler. If see a jobbler, I will shoot it. I have also been blessed with calling in and shooting two super cool gobblers that had 1 ½” spurs and weighed over 27 pounds. In a word….those were awesome. It makes all the failures so worth it. 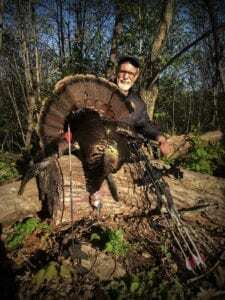 If you have not tried turkey hunting with a bow, don’t just take my word for it- try it yourself. Just be prepared to see your fishing tackle gather dust.